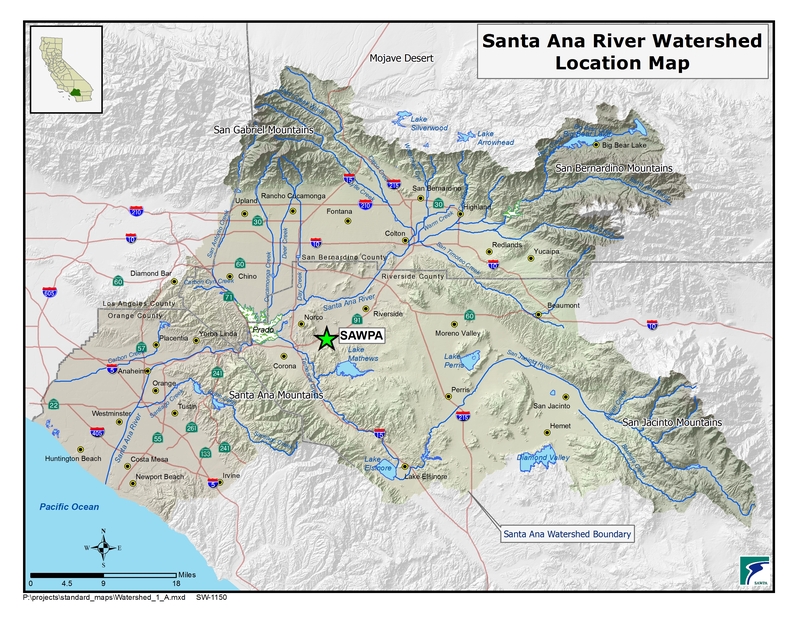 The Santa Ana River Watershed is Southern California’s largest watershed that has been largely channelized, diverted and urbanized. It begins approximately 96 miles away from the coast and contains over 50 tributaries. The primary waterway is the Santa Ana River, which is about 700 miles long in length with its tributaries. Its headwaters are located high above the valley floors of the Inland Empire, in the San Bernardino Mountains, crossing through central Orange County before emptying into the Pacific Ocean. The watershed catches storm water in 2,650 square miles of mountains, foothills and valleys that drain into the Santa Ana River in four different counties: San Bernardino, Riverside, Orange County and a small portion of Los Angeles County. Today the watershed is home to more than 4.8 million residents. The watershed is divided into two sections: the Upper and Lower Watershed. The Upper Watershed starts from the San Bernardino Mountains runs along to the Prado Basin at the 91 and 71 freeways. Most of the upper portion of the watershed is a tributary to the river in the Riverside and San Bernardino Counties. The Lower Watershed starts at the south of the Prado Basin and extends to Pacific Ocean. The lower portion of the watershed includes segments of the cities of Anaheim, Brea, Huntington Beach, Orange, Placentia, Santa Ana, Villa Park, and Yorba Linda. Having lived in Santa Ana watershed I realized I never thought about the Santa Ana River. Awareness is not something that really comes to mind when you are washing your dishes or doing your laundry or passing it on the freeway. Still after taking this class I realize that it is of utmost importance for people to be educated on process of water and how it is vital part of their community.